Today was the final day of the semester and we finished watching our sixth and final film, Andrew Lloyd Weber’s Jesus Christ Superstar (1973). This was the only musical (actually, “rock opera”) we watched and it was my first time watching the film all the way through. I was surprised to find that, unlike most musicals, there was no dialogue in between musical numbers. The dialogue throughout the entire movie consisted of sung lyrics. Though there are appearances and songs by Mary Magdalene and Simon Peter, it was interesting to see the lyrical dialogue and dramatic tension revolve primarily around the relationship between Jesus and Judas Iscariot. The entire conflict is seen through the eyes of a clearly troubled Judas. Halfway through the film I found myself thinking about other presentations of Judas’s role in the Jesus story including The Passover Plot and the Gospel of Judas. The next time I teach this course I will probably include those readings along with the module for this film. As I have mentioned throughout this series of posts, we began the semester with an exercise we called, “Problematizing Chalcedon.” We wanted to help students think through the complicated matters associated with the human/divine relationship that is such a key component to orthodox expressions of Christian doctrine. I thought this film, more than the others, beautifully captured that concern in the lyrics to Mary Magdalene’s big number, “I Don’t Know How to Love Him,” (which Judas reprises near the end as he expresses regret for betraying Jesus). The next time I teach this course, I may have students reflect on the lyrics to this song (see clip below) and have them write an essay on how this song takes seriously the Chalcedonian tension. Of particular interest to me (and to the class) in our analysis of the film and its broader cultural impact was an appearance by Michael Palin and John Cleese on the UK show, “Friday Night, Saturday Morning” in November 1979 (see video below). The two appeared opposite Malcolm Muggeridge and Mervyn Stockwood (the then Bishop of Southwark), both of whom came across as stuffy, insulting, and condescending. (This was not lost on my students!) In the appearance, you get a very clear sense of the intelligence and thoughtfulness that attended the writing of the film. Cleese, in particular, ably articulates his frustration with the domesticated Jesus of institutional Christianity and the intellectual dishonesty to which he was exposed during his time in Christian school. Cleese also insists that Brian is not intended to be Jesus. As much as I enjoyed this interview, I chafed a little at the suggestion that Brian is not intended to be Jesus. This seems disingenuous to me. 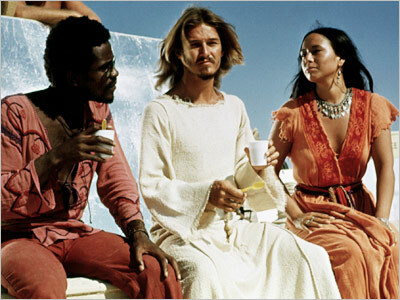 I think today most reflective viewers of the film recognize that Brian is Jesus, at least in most respects. After all, isn’t that what makes the movie work so well? You can find a plot summary and a list of the allegorical elements of the film here. Tomorrow we will begin watching, The Life of Brian. I can’t wait to see how the students respond to that one. I’m sure there will be lots to talk about next week! I am a few days behind (it’s been a busy eight days!) but this past week our class watched the 1998 Jesus film, The Book of Life. Prior to preparing for this class, I had not been exposed to this film. My colleague suggested that we watch it because it provides a much different angle than the other films we’ve been watching and discussing. Admittedly, this film is a little campy, the writing is mediocre, and the acting leaves a lot to be desired. There is also a hazy, purposeful disorientation in the cinematography, so this one was a little more difficult to watch–though it is shorter than most other Jesus films (66 minutes). 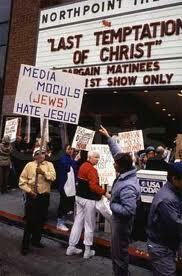 Nevertheless the film raises questions that are important to certain Christian understandings of Jesus. The film is set in New York City on the eve of the new millennium. Jesus, a handsome, well-coiffed, suit-wearing, white guy with a chiseled jaw has come to the Big Apple with “Magdalena” (played by British rocker, P.J. Harvey) to consummate the plan of God–APOCALYPSE! Specifically, he has come to open the Book of Life (which is playfully presented as an Apple laptop computer), and either save or damn all of humanity. Anyone who was around back in the late 90s remembers the various strands of Christian apocalyptic speculation, often accompanied by the idea that Jesus was going to return at midnight on January 1, 2000 (Eastern Standard Time of course, because the world supposedly revolves around the east coast of the US). A lot of that thinking is present in this film, though it was lost on our students, most of whom were not quite 10 years old during that period. This film muses playfully with the idea that God intends to destroy the world and that this is the primary idea presented in the book of Revelation. The film assumes a somewhat unsophisticated acceptance of one narrow reading of Revelation alongside an equally narrow interpretation of Christian theology. Still, the film raises questions that are useful for helping students think about how Jesus is presented in various theological systems: Did Jesus have a human will? Could he have been “disobedient” to the Father? Was it possible for Jesus to be tempted or sin–questions that approach modern, mainly evangelical discussions of peccability v. impeccability. As you can imagine, some of our more traditional students thought the film was borderline blasphemous in that regard. We also planned to watch this movie during the same time the new Left Behind movie was released, for the very purpose of talking about apocalypticism in modern western Christianity. However, the new Nicholas Cage vehicle has been so universally panned that we decided it would not be useful to mention it. Today we going to discuss Marcionism and the ways in which the film raised issues related to judgment of a vengeful God and the love of a gracious Jesus. 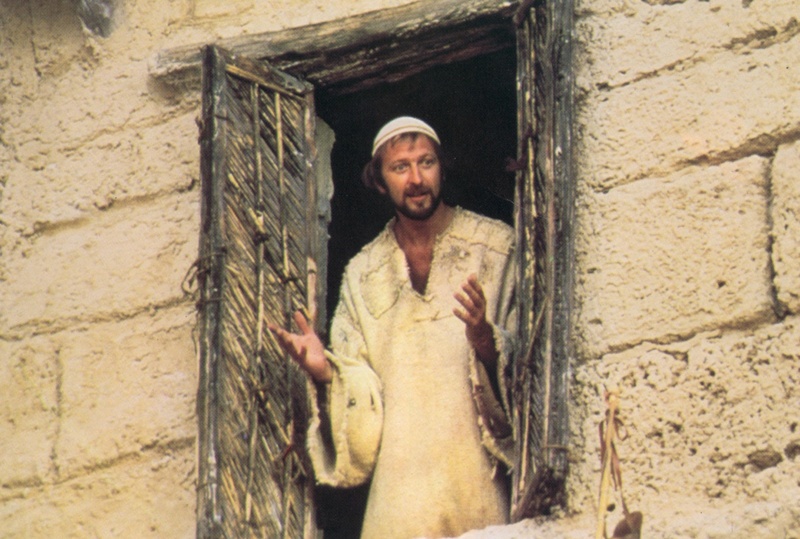 Our fall break is next week, after which we will move on to Jesus of Montreal and then the Life of Brian. In preparation for yesterday’s class we had students read the Gospel of Judas and exposed them to the issues surrounding its discovery, translation, and dissemination to the wider public. We felt that this text had an important connection to the film we just finished watching. 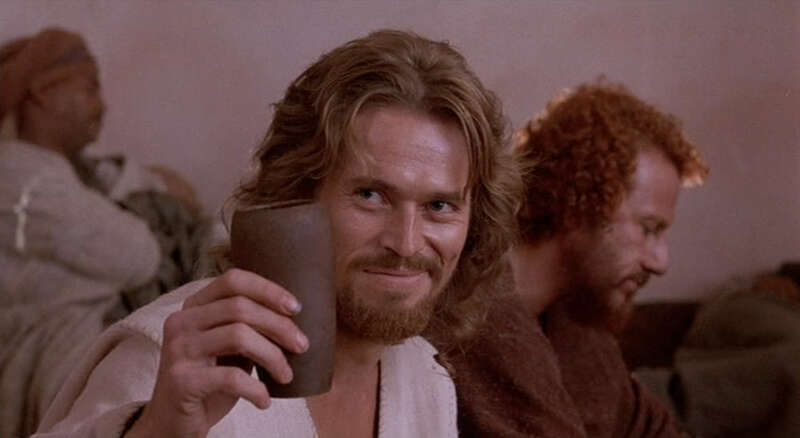 In Scorsese’s Last Temptation of Christ, Jesus and Judas are depicted as the best of friends and Jesus ultimately asks Judas to betray him so that the will of God can be done. This is not unlike the situation we see in the Gospel of Judas. If you haven’t read the Gospel of Judas, you should know that it is dripping with a heavily Platonic understanding of the spirit/matter duality that was critical to various expressions of Gnosticism in the first few Christian centuries. Spirit is “good” and matter is “evil,” and Judas is the hero figure who betrays Jesus so that he can die and be released from his evil body. 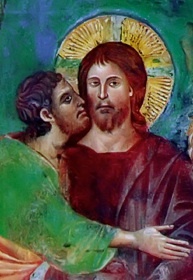 (1) What are your thoughts on these similar portrayals of the relationship between Jesus and Judas? (2) How do you typically conceive of the relationship between the material (body) and the immaterial (soul, or the “inner-life”)? (3) What factors influence how people understand these various portrayals of Jesus? As with previous class discussions, many of our students found the presentation of Judas in the Gospel and in the movie so unfamiliar that they struggled to articulate their thoughts. If we are accomplishing anything this semester, we are—at the very least—helping students who were previously mired in a very myopic understanding of their own Christian tradition see beyond themselves. Tomorrow we move to our third film of the semester: The Book of Life. We have spent the past two days in class wrapping up our discussion of The Last Temptation of Christ. Today we introduced students to the ins and outs of the controversy that developed as protests broke out throughout the US and in the UK. We showed a number of pictures from the protests and analyzed the sentiment expressed there. Not surprisingly, the protest signs we examined were more about proclamation (viz., “Jesus is the same yesterday, today, and forever,” or “Lies about Jesus!”) than they were about persuasion. This led into a discussion about what it means to be reactionary vs. what it means to be reflective and careful in our analysis of such issues. One surprising element of our discussion, and something that escaped my notice in the past, was the rampant anti-Semitic sentiment that arose during the protests. (See picture to the right). The argument seemed to go: (1) Jews run Hollywood, and (2) Jews want to make Jesus look bad, therefore (3) Jesus-hating Jews are responsible for creating this film. Curious reasoning when you consider that the film was made by an avowed Catholic (Martin Scorsese) about a book written by a self-professed Orthodox Christian (Nikos Kazantzakis)–who, we should point out, was excommunicated because of this very book. We also watched a brief clip from a much longer episode of the Oprah Winfrey show where Protestant, Catholic, and Orthodox clergy were vociferously disagreeing with one another. The class was amazed at how so many people consciously, openly self-identifying as “Christian” could be so hostile toward one another in a context in which there was such wide disagreement about Jesus and about theology. We divided the students into smaller groups and had them answer questions about their takes on both the film and the controversy. We will continue this exercise on Monday. I look forward to sharing more of what comes up. For now, here’s the full episode of Oprah, in case you’re interested (though please note, this version is comes from a site that exists to promote propaganda for an orthodox priest). Enjoy…..
Today in my Jesus class we began watching Martin Scorsese’s (in)famous film, The Last Temptation of Christ. We are asking our students to go through several intellectual exercises as they watch these films. First, we want them to ask, “If this film were the only source of my knowledge about Jesus, what would I know about him?” In other words, we want them to do their best to divorce themselves from what they already know (or think they know) and look at Jesus through fresh eyes. Second, we are trying to get them to think about various presentations of Jesus in light of the Chalcedonian definition. We want them to note where certain portraits of Jesus lean toward either the human or divine. Even though we are only a third of the way through the film, I can already tell by the looks on students’ faces that they are receiving Scorsese’s Jesus with greater reluctance than Gibson’s Jesus. The portrait in Last Temptation is one of my favorites because, for all of its idiosyncrasies, its presentation of Jesus is so raw and unrestrained. The film can be very very slow (especially at the beginning) but the way it pictures Jesus coming to terms with his call (almost like a headache he can’t shake) is so compelling. It also easy to get a feel for how certain crowds could have simultaneously found him both crazy and compelling enough to follow. Our readings of the Gospels–like our understandings of Jesus–can be very docetic at times. This film prevents us from lapsing into such myopia.